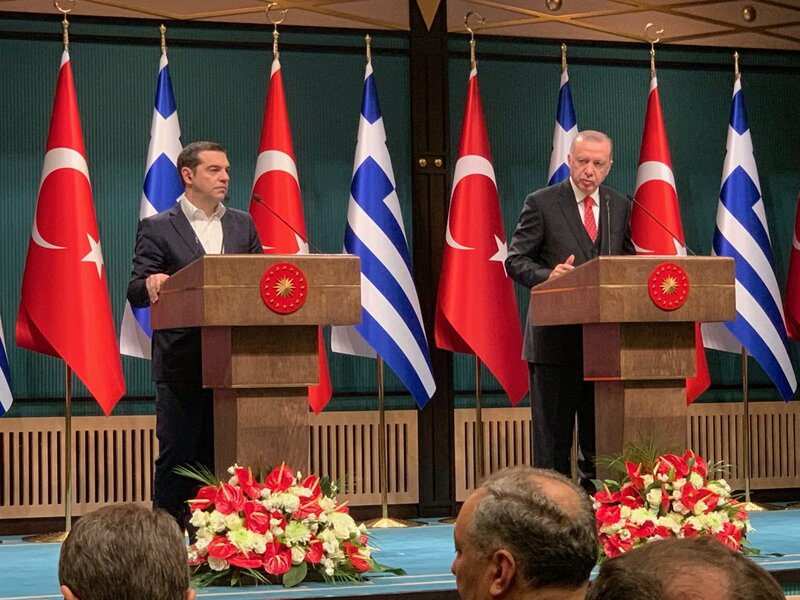 The schedule of Alexis Tsipras’ two-day visit to Turkey was concluded with the meeting of the Greek Prime Minister with representatives of the Greeks of the City (Istanbul). The Greek Prime Minister arrived in Ankara on Tuesday, February 5, where he was received by Turkish President Recep Tayyip Erdogan in a particularly good climate, which was also evident in the statements of the two leaders to the representatives of the press. Both the Greek and the Turkish side welcomed the visit of the Greek Prime Minister, during which there was a sincere dialogue on all the issues that were discussed. Both leaders avoided the escalation of the differences and focused on the positive agenda of bilateral relations, although the major differences between the two countries were the focus of a big part of the discussions. Within this framework, the two sides agreed to hold bilateral contacts between Ministries and Ministers, in order to reduce tension, the preparation for the resumption of talks on the Cyprus problem, enhancing security, the refugee crisis, as well as the activation of joint actions for energy and the economy. The very good climate of the visit was also reflected during the dinner that Recep Tayyip Erdogan hosted in honor of the Greek Prime Minister, to which both the Ecumenical Patriarch and the Greek basketball player Costas Sloukas, who is playing for Fenerbache, were invited. On Wednesday, February 6, Alexis Tsipras, accompanied by his companion and the Greek delegation, was given a tour of Hagia Sophia. Following that, he then went to Halki Island, where he was received by the Ecumenical Patriarch Bartholomew at the Theological School of the same name. It is noteworthy that the Greek Prime Minister was accompanied in these visits by the representative of the President of the Republic of Turkey Ibrahim Kalin, a powerful man of the country’s political life.